Random procedurally-generated maps in three sizes and terrain types. Free-form layout of rail lines, roads, and buildings. No grid. Good variety of equipment from 1850 to 2014. Track and road layout tools are powerful (but can be frustrating too). Automatically evolving buildings and towns as they grow and age. Designed with mod support in mind. Documentation is limited at this point. Read the forums! Issues causing track and road tools to fail are not explained very well, leading to frustrating “Why won't this work?” puzzles. Cannot build roads over rail lines, only rail over roads. Financial balance seems slightly off, with high equipment operating costs versus relatively low rail line construction costs. Performance lags late-game on the medium size map since there's more equipment running and larger towns to simulate. I haven't tried the large size yet. User interface could use some cleaning up. An entertaining sandbox in which to experiment with different approaches to running a profitable rail empire. Before I get too deep into describing some parts of the game, here's a few screen shots to give you an idea of what it looks like. 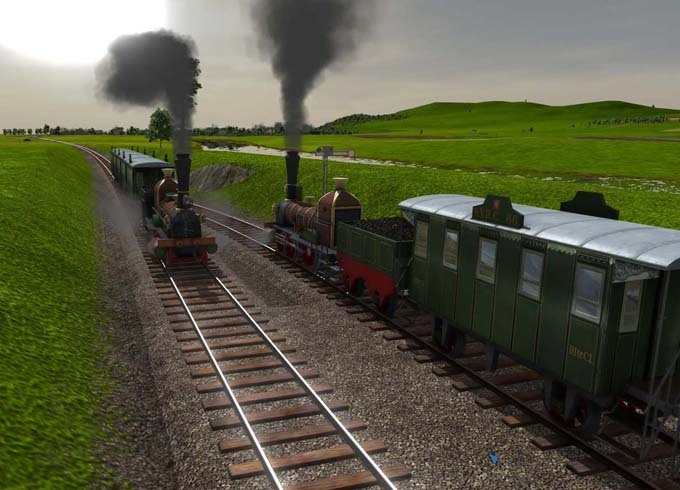 The game starts with simple 1850's locomotives. Here's a meet way out in the countryside between towns. While featuring mostly German and Swiss equipment, the famous 4468 Mallard is included too, shown below pulling out of an early town. The TGV is expensive to buy and maintain, and so far I haven't found a situation where it attracts enough passengers to make it profitable. Maybe on the large map size. Until you gain experience with the rail and road layout tool, you will hit situations where it looks like it should work, but it won't. The little tool-tip error messages and red shading of problem areas do not always clearly describe what's causing the issue. A road cannot cross a rail line. You must delete a section of railway, draw out the road, then re-build the rail line. Or create a bridge or underpass, which bring their own construction challenges. Hopefully this restriction will be lifted in a future patch. A road cannot cross another road. You need to make a 'T' intersection, then extend the road on the other side to make it an 'X' intersection. When attaching one road to another, it needs a certain length to successfully create the intersection. But sometimes, due to previous editing, roads may be broken into smaller pieces. You can't see the difference, but the layout tool won't work and the error tool-tip message is not too helpful. Similarly, when laying a rail line across a road, it needs a fair amount of room along the road to create the level crossing. If the location is too close to a road intersection, it won't work. If it's too close to another rail line, it won't work. Frustrating for those busy rail corridors. When a rail line crosses a road, it may be forced up or down slightly to match the level, then sloped to match up with the surrounding terrain. This can lead to an unwanted roller coaster effect in track elevation. You cannot build a level rail crossing. You can join one line to another with a switch, then immediately add another switch so the second route diverges again, making a sort of elongated 'X' shaped junction. Add signals to control access through the junction. Or you can build a bridge to carry one line over another. This will take more room to gain elevation than you probably expect at first. Since the game covers the time period of 1850 to 2014 (and beyond if you wish) the developers chose a time scale which allows you to play all the way through without taking weeks to do so. However this has the side effect of train trips taking months to complete. For example, a high speed express TGV line from one side of a medium map to the other can take over four in-game months to complete. With only a few trips completed per year, the profits from a route can vary wildly from one year to the next, depending solely on whether a train happens to arrive in December or in January of the next year. An improvement would be to include a user-adjustable time scale when starting a new game, similar to the feature found in the Civilization series of games. Players could, say, set it so time passes only half as quickly and trips take a more reasonable length of time. Passenger fares would be halved to keep the economy balanced as it is now. Laying out a passenger station and tracks beside a town tends to cut off development in that direction. 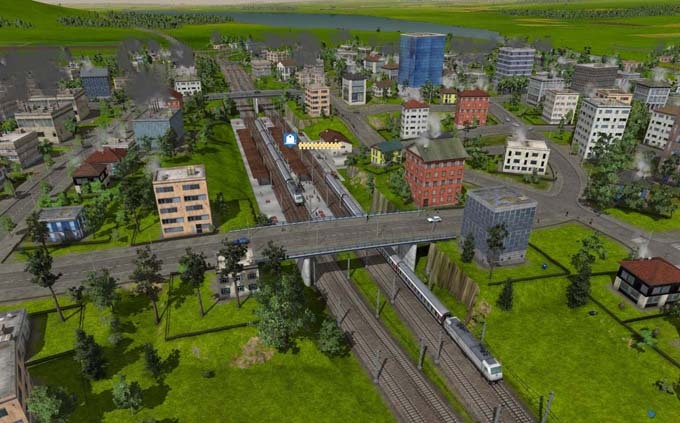 I wanted the game to generate the feel of a big city rail hub with larger buildings on both sides of the tracks. Roads crossing the tracks very close to the station are needed so the population are tempted to build over there, but placing roads right after the station platform makes it impossible to lay rail lines across them. Building road bridges over the railway will work, but I wanted to avoid the typical heavily arched style produced by the game. Partially sinking the rail terminal below ground level allowed more natural looking bridges. To create a gradual depression I used long stretches of wide roadways and pressed 'N' to sink them into the ground. Then I bulldozed the road, leaving behind the modified terrain. Arranging the overpasses was a delicate business so the supporting pillars wouldn't block the tracks. As shown above, one bridge ended up with no middle supporting pillar at all, while the other overpass had the more typical configuration with a central pillar dividing the two sets of tracks. I tried to smooth out the slopes as best as I could, but after a few years the game had auto-generated nearby buildings with some unnaturally steep cliff-like terrain. Oh well. If you want to experiment with this sort of setting, be sure you've got lots of cash. Building the station above, which including bulldozing a fair chunk of the original town, cost about 23 million. The game's Hard difficulty level certainly is hard. Running costs are several times higher and revenues are cut dramatically. I went broke a couple of times before making it to year 2000. It seems the best approach is to completely ignore the 'train' in Train Fever. You can make a bit of money with the first two locomotives, but after that rail operating costs quickly escalate and make those lines unsustainable. There's no point in constructing railway infrastructure for such a short period of time only to pay to bulldoze it later. Instead concentrate on moving goods and people by roads. Carry cargo via wagons and trucks. This gets you started. Try to find a spot where a raw resource passes close to a town on its way to a production location. For example, there was an oil well that was sending oil down the road near my town and off to a refinery. By building a cargo station on that edge of town and one at the refinery, my wagons / trucks could carry oil in one direction and goods in the other, doubling the usual payouts they would generate. No empty trips. Use trams to carry passengers between cities. This models sort of an interurban-style passenger service and it will be your bread and butter in Hard mode. Try to upgrade equipment as newer trams are released so they will be as fast or faster than car travel and therefore continue to attract passengers. Convert tram routes to buses. In the mid-50's tram speed falls behind automobiles and ridership will drop. Don't wait for that, convert tram routes to buses as soon as their speeds become greater, basically when the Mercedes-Benz bus is launched in 1951. Think about where city streets should go when you're planning a town's station location and build them first. This is the only way to create a level crossing, since we currently can't add a road over an existing rail line. 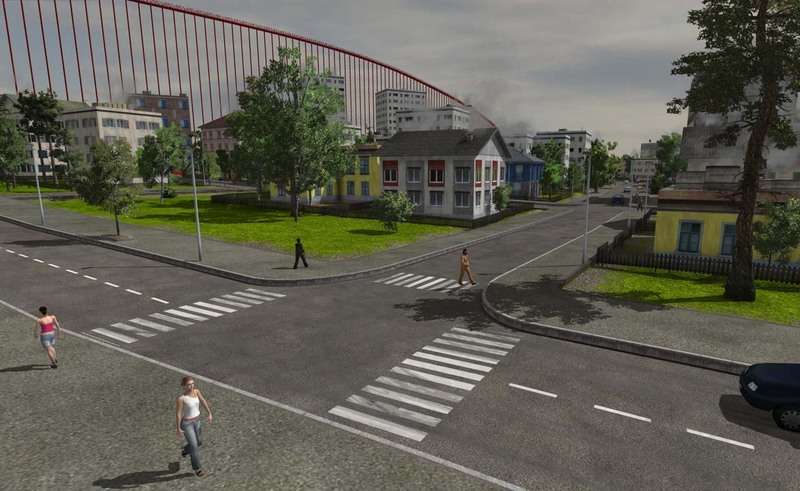 Build the street for your town's station with a gentle curve. By sliding the station along it, you can easily control its exact angle. Rail lines will then head off in the correct direction. A road bridge or underpass can be created by laying out a strip of roadway and using the 'N' and 'M' keys to lower or raise the roadway. Try to place your passenger station close to the residential (green) section of town, and the cargo station close to the industrial (blue) section. This will minimize travel distance / time. 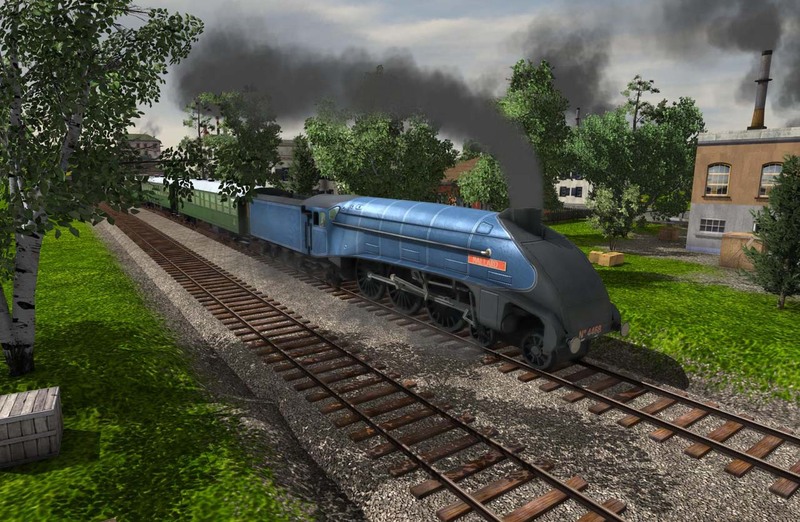 In the later, more modern era of the game, auto traffic is faster and as a result fewer passengers may be interested in your passenger trains. You can upgrade your equipment and rail lines but that only helps to a degree. The other approach is to sabotage the roads. Edit the route to make it long and twisted and people will flock to your trains. Hey, aren't rail barons supposed to be cut-throat? Trying for the 300 kph Speed of Light achievement? Yes, you'll need the TGV but you'll also need a long uninterrupted route so it can build up to speed before having to start slowing for its destination. Those last few clicks come painfully slowly. On a medium size map, I had build a line from a town in one corner to about the middle, up towards another corner, then curve back and go to the opposite corner. A waste of money, so only do it when you've got lots to spare. When you're rolling in cash, you can use long roads with the 'N' and 'M' keys to quickly edit large strips of terrain. Create the road, raise or lower it as desired, then erase the road to leave the modified ground behind. The game's 'Glacier Line' achievement for running a rail route at a height of 450 meters is meant to be gained when building on a hilly terrain type map. So of course I wanted to see if it could be done using a bridge starting from sea level. My first attempt went across a medium size map but couldn't get high enough before sloping back down again. Looks more like a roller coaster than a railway. The folks living there didn't seem to notice the giant rail bridge skirting the edge of their town. My second attempt headed for some low hills along one edge of the map. This reduced construction costs enough that I could extend the bridge higher before returning to earth. I didn't even have to hit the summit to get the 'Glacier Line' achievement. Total construction cost? A mere 1.32 billion.